This is a very special post for me, as its my Blog Anniversary! Yes, my blog has completed 5 years and stepped into the 6th year and also crossed 16 lakh hits. I thank all my readers, bloggers and friends who spend their time in reading my posts , commenting and trying my recipes. A huge THANKS to each and every one of you for your support! Recently, I had this prasadam in ISKCON temple. 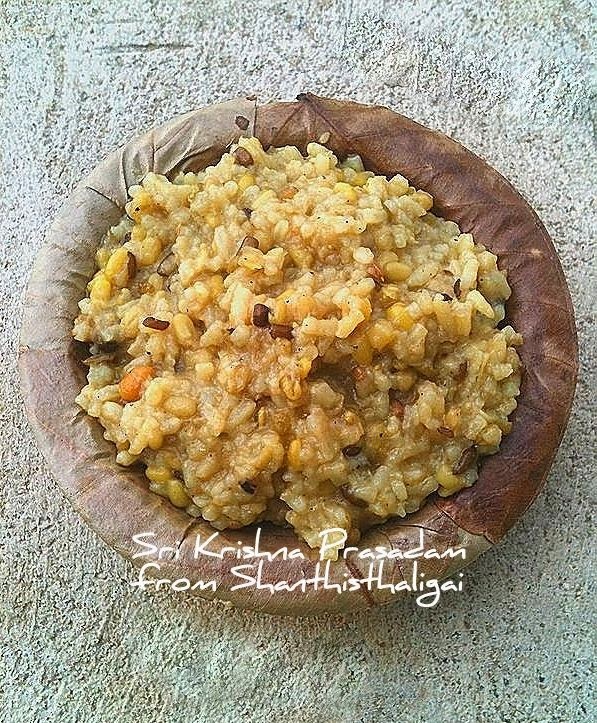 This was different from the usual Vennpongal of South India and Khichri of North India. I asked the temple authorities about it and they told me the ingredients they used for this Mahaprasad. Ofcourse, the recipe is simple and needless to say, prasadams offered in temples have a distinct flavour. The prasad "as it is" is here for you. Pressure cook rice and dhals without adding salt. In a pan, heat a spoon of ghee and fry cashews & peanuts until golden brown. Keep aside. In the same pan, heat oil, add pepper. When pepper splutters, add cumin seeds, fennel seeds, curry leaves, grated ginger, and hing. Pour these over the rice. Add salt for rice and mix well. Add ghee fried cashews & peanuts. Top with melted ghee.Offer it to the LORD with a tulsi leaf. Congrats shanti,keep rocking as usual ! Wow 5 years is quite a commendable milestone!! Congrats and thanks for sharing a divine recipe!! very very comforting and healthy khicidi :) looks yummy ! !